Harry's biggest task in this build up was creating the roof. 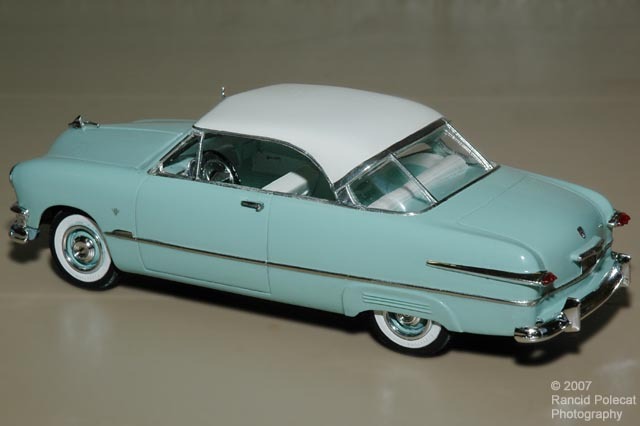 With the model being based on an AMT 1950 Ford convertible, Harry grafted the front half of the convertible top to the rear half of a Lindberg 1953 Victoria roof. After adding the lower rear window trim, Harry was pleasantly surprised to find that the 1953 Victoria rear window popped into place without further body modifications. In the image above, you can see where Harry removed the external trunk hinges and extended the side body trim to wrap around the rear of the car. Also visible are a resin trunk handle, taillight assemblies, and rear windsplits that Harry got from the Modelhaus.